Langerhans cell histiocytosis (LCH), formerly histiocytosis X, is a rare entity which may appear under 3 distinctive clinical forms, namely eosinophilic granuloma Hand-Schüller-Christian syndrome and Letterer-Siwe syndrome . These 3 disorders present in common a proliferation of Langerhans cells. While the etiopathogenesis of LCH remains unclear, some evidence suggests that the disease results from an imbalance of immune regulation [1-3]. The clinical profile of LCH is unique. Its extent may vary from a unifocal disease to a multisystem manifestation. Eosinophilic granuloma represents the most common form of LCH and affects older children and adults, most patients being younger than 20 years of age. It shows a predominant bone involvement occurring as a unifocal or multifocal osteolytic lesion without visceral involvement, with jaws lesions appearing very often [3-5]. The Hand-Schüller-Christiandisease affects mostly 2- to 6-year-old children. It is characterized by a classic triad with osteolytic lesions, exophthalmos and diabetes insipidus. Patients can present lymphadenopathy, hepatomegaly, and splenomegaly. Oral manifestations are present in most cases and mainly include jaw lesions affecting the alveolar bone, leading to dental mobility and premature tooth loss . The Letterer-Siwe disease occurs most frequently before 2 years of age. This disease is characterized by skin rash, hepatosplenomegaly, anemia, lymphadenopathy, pulmonary and bone lesions and runs an acute or subacute course [1, 3-5]. The latter clinical form can be fatal if left untreated . Oral soft-tissue lesions of LCH have been described, usually occurring simultaneously with jaw lesions and rarely in the absence of bone involvement. The occurrence of manifestation of LCH restricted to oral mucosa is quite uncommon, there have been only four reports published in the scientific literature since 1987 [6-9]. 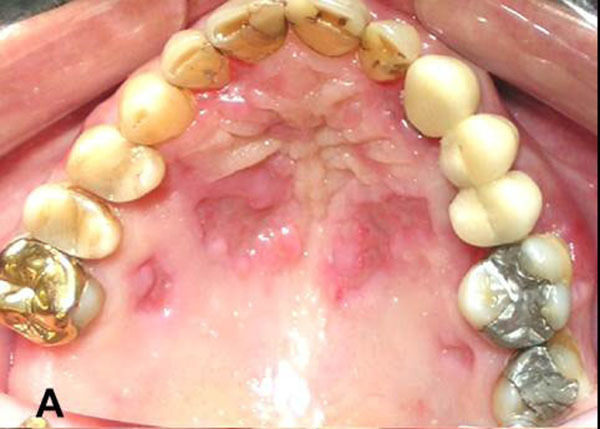 This article reports a case of LCH focusing on the diagnosis and the management of painful oral mucosal lesions as the sole manifestation of this disease. A 65-year-old white woman was referred to our clinic in 2006 for diagnosis and treatment of painful oral ulcerations that had been present for approximately two months. She complained mostly of great difficulty on eating, which had caused her to lose 5 kg through the last months. 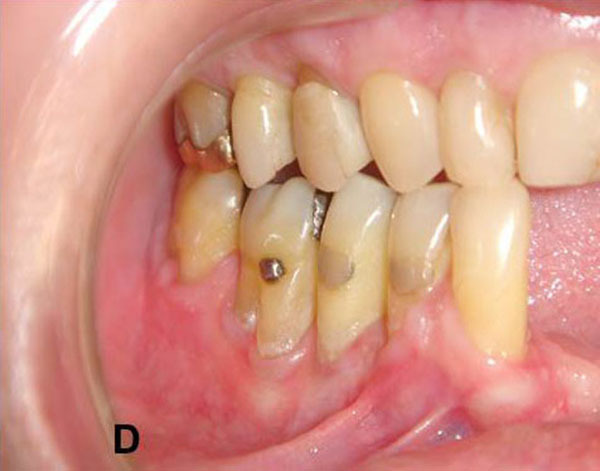 Intraoral examination showed multiple non-bleeding ulcerations affecting especially the palatal mucosa (Fig. 1A) and slightly on the lower gingival mucosa (Fig. 1B). Her general health had been compromised by a breast cancer, which had been treated by surgery along with radiotherapy and chemotherapy. She had developed metastatic bone lesions and was receiving bisphosphonates (Aredia®). Clinical diagnoses included membrane mucosa pemphigoid, erythema multiform and Langerhans cell histiocytosis (LCH). A biopsy of a palatal ulcer was taken, and the specimen was submitted to histopathological and immunohistochemical examination. Fig. (1) Multiple ulcerations on the hard-palate mucosa (A). A small and isolated ulceration on the gingival mucosa (B). Substantial improvement after intralesional injections (C and D); Ulcers replaced by scars on the hard-palate mucosa following the intralesional therapy (D). Microscopic examination of hematoxylin-eosin-stained slides revealed proliferation of large mononuclear cells with rounded to ovoid pale nuclei, sometimes grooved and with indistinct cytoplasm. A large number of eosinophils and lymphocytes were also observed (Fig. 2A). Since these histologic features were consistent with LCH, additional analysis was made with immunohistochemical assay, which showed positive reaction for CD-1A antibody (Fig. 2B). These histologic findings together with positivity for CD-1A antibody are confident diagnostic criteria for LCH [6, 10]. The diagnosis of LCH prompted to refer the patient for thorough medical examination, which found no involvement of internal organs, lymph nodes or blood cells. A complete skeletal radiographic examination revealed no bone lesion either. Therefore, the final diagnosis was Langerhans cell histiocytosis of the oral-soft tissues. Management was then focused on controlling the painful oral ulcer, mainly the palatal ones. In light of the potent side effects of systemic corticosteroids or immunosuppressive agents, topical medication was used, instead. Initially, the patient was treated with 0.05% clobetasol propionate in orabase three times a day. After 4 weeks of treatment only a small benefit was reported by the patient. This medication was then replaced by intralesional injections of 10-15 mg triamcinolone acetonide diluted in 3% prilocaine, which was applied at 15-day intervals. After 5 sessions of steroid injections, substantial remission of the ulcers accompanied by great relief of pain was achieved (Fig. 1C and 1D). After 12 months, since the last injection, she was in a fairly stable oral health. Unfortunately, in 2008 the patient developed brain metastasis and died as consequence of this latter involvement. Fig. (2) Microscopic findings showed histiocytic cells scattered below the squamous epithelium, usually with folded nuclei and dispersed chromatin, and also numerous eosinophil leukocytes (A and insert; H&E, x 40). Histiocytic cells were positive for CD1a antibody after immunohistochemistry (B). LCH is a rare disorder that occurs at all ages but predominantly affects children and young adults. As adult cases are rare, the clinical features in these patients are poorly defined. Oral soft-tissue lesions of LCH usually occur simultaneously with jaw lesions and rarely in the absence of a definable bone involvement. In the present case, the patient developed oral mucosa lesions exclusively without involvement of jawbones or any other bone, or internal organs. To make a clinical diagnosis of LCH when its lesions are restricted to oral mucosa usually is very difficult since only few cases have been reported on the literature [6-9], thus producing limited information of this uncommon manifestation of this disease. Basically, the clinical features of LCH on the oral mucosa are mainly characterized by painful ulcerations, usually involving the keratinized sites of the oral mucosa, i.e. hard palate and attached gingival mucosae. All cases of LCH reported on the literature affecting the oral mucosa exclusively occurred in adult patients, mostly over 50 years old [6-9]. This present case is all agreement regarding site involvement and patient’s age. Differential diagnosis may include viral infection, autoimmune disease, and drug-related ulceration. 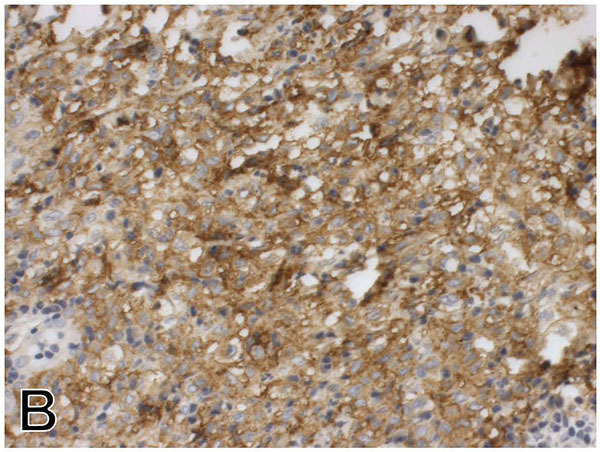 A diagnosis of LCH must be confirmed by immunohistochemical assay showing a positivity reaction for CD-1A antibody. In terms of treatment, patients with single-system disease confined to a single site usually require only local therapy or observation. It has been reported that solitary lesions (mostly seen in the eosinophilic granuloma form of LCH) may undergo spontaneous resolution ; but this has just happened in only few cases . In most of the cases treatment is required, and this is usually handled either by surgery or by intralesional injection with corticosteroids [3, 12]. Patients with somewhat more extensive disease (multiple bone lesions or multiple lymph nodes) usually require systemic therapy. The best therapeutic option in these cases has not been defined, and responses have been observed with short courses of steroids with or without the addition of chemotherapeutic agents . The present case was preferably treated with topical therapy, on the grounds of that the lesions were confided to the oral mucosa and the patient had been received chemotherapy for management of her breast cancer; therefore precluding the patient to be treated with any other systemic medication, such as corticosteroid or immunosuppressive agents, which could compound to her already debilitated organism. For this case, the use of intralesional injection of corticosteroids was highly instrumental for the control of painful oral ulcerations since the use of high-potent corticosteroid in ointment-base had failed to promote any benefit. Unfortunately, while her oral condition had improved, her systemic condition did not. Despite the intense therapy for her breast cancer it did not avoid the spreading of the tumor, resulting in the death of the patient. Histiocytosis syndromes in children. Writing Group of the Histiocyte Society. Lancet 1987; 1(8526): 208-9. Leonidas JC, Guelfguat M, Valderrama E. Langerhans’ cell histiocytosis. Lancet 2003; 361(9365): 1293-5. Lee S-H, Yoon H-J. Intralesional infiltration of corticosteroids in the treatment of localized Langerhans cell histiocytosis of the mandible: report of two cases. Oral Surg Oral Med Oral Pathol Oral Radiol 2013; 116(4): e255-60. Eckardt A, Schultze A. Maxillofacial manifestations of Langerhans cell histiocytosis: a clinical and therapeutic analysis of 10 patients. Oral Oncol 2003; 39(7): 687-94. Hicks J, Flaitz CM. Langerhans cell histiocytosis: current insights in a molecular age with emphasis on clinical oral and maxillofacial pathology practice. Oral Surg Oral Med Oral Pathol Oral Radiol Endod 2005; 100(2 Suppl): S42-66. Bottomley WK, Gabriel SA, Corio RL, Jacobson RJ, Rothchild N. Histiocytosis X: report of an oral soft tissue lesion without bony involvement. Oral Surg Oral Med Oral Pathol 1987; 63(2): 228-31. Finney DS, Rees TD, Wright JM, Blanton PL. 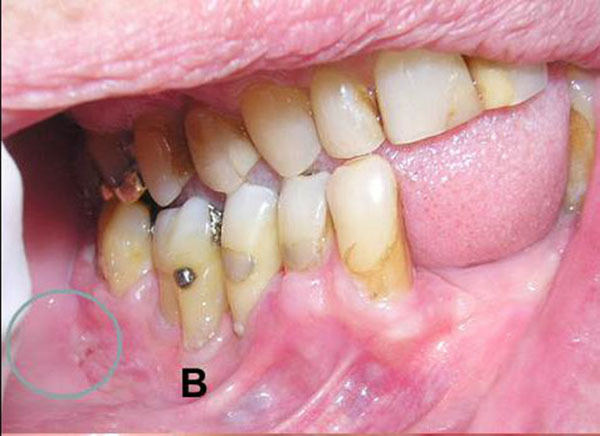 Solitary eosinophilic granuloma (histiocytosis X) of the gingiva. A report of two cases. J Periodontol 1988; 59(7): 457-60. Cleveland DB, Goldberg KM, Greenspan JS, Seitz TE, Miller AS. 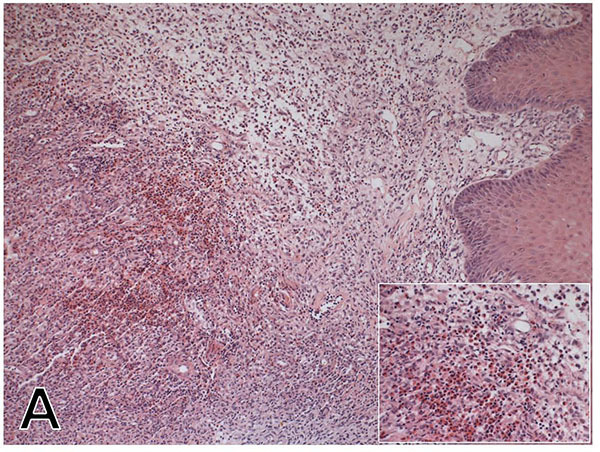 Langerhans’ cell histiocytosis: report of three cases with unusual oral soft tissue involvement. Oral Surg Oral Med Oral Pathol Oral Radiol Endod 1996; 82(5): 541-8. Milián MA, Bagán JV, Jiménez Y, Pérez A, Scully C, Antoniades D. Langerhans’ cell histiocytosis restricted to the oral mucosa. Oral Surg Oral Med Oral Pathol Oral Radiol Endod 2001; 91(1): 76-9. Takahashi K, Harada M, Kimoto M, Kondo F. Diagnostic confirmation of Langerhans cell histiocytosis of the jaws with CD1a immunostaining: a case report. J Oral Maxillofac Surg 2003; 61(1): 118-22. Esen A, Dolanmaz D, Kalaycı A, Günhan O, Avunduk MC. Treatment of localized Langerhans’ cell histiocytosis of the mandible with intralesional steroid injection: report of a case. Oral Surg Oral Med Oral Pathol Oral Radiol Endod 2010; 109(2): e53-8. 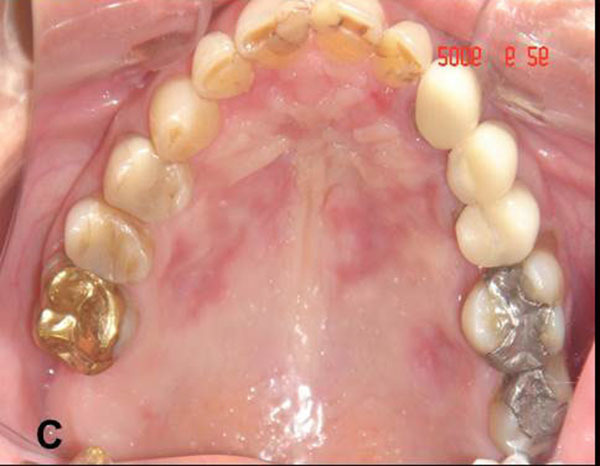 Plona GA, Wiltz M, Kelsch R. Spontaneous resolution of an eosinophilic granuloma of the mandible following open biopsy. Oral Surg Oral Med Oral Pathol Oral Radiol 2015. pii: S2212-4403(15)01324-3.